Hundreds of meticulously hand-drawn frames of 2D art are used within beautiful 3D environments to create detailed worlds and expressive characters. An entire ancient hieroglyphic language awaits to be deciphered. A puzzle mechanic with a twist: solutions are narratively significant and further the story - but the wrong translation might send you down the wrong track! The pictorial nature of both Ancient Egyptian and Chinese writing systems inspired the glyphs of Heaven's Vault. Words are formed out of smaller "atoms", as they often are in German. Jump aboard Aliya's ship, the Nightingale, and sail the rivers of space to discover the secrets of the Nebula. Locate lost moons, and explore freely in a massive world. Drifting ruins scattered throughout the Nebula may help Aliya find clues to lost dig sites. Decide which sites are important as you trace the path of civilisation back through the centuries. Free-roaming, third person exploration of a wide variety of locations: ruined palaces, desert moons, market towns and thriving farming villages. 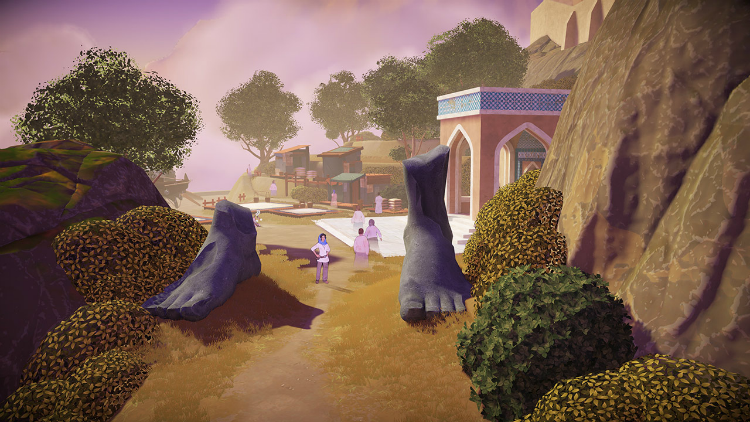 Locations in Heaven's Vault can be explored in different ways, but whichever way you go, the story is always moving. Whatever may happen, there is no turning back! A diverse cast of characters remember and react to everything you do. Some are friendly, some are cautious, and some will try to trick you. You have been warned! There are big decisions to be made here, but, most thrillingly, throughout the course of the adventure I found myself surrounded by the constant fluttering of smaller choices - how much to reveal to an ally, how to respond to my companion's latest micro-aggression, and whether, even, to interpret it as an aggression at all. ...Heaven's Vault is filled with ingenious stuff, whether it's the nearly-invisible shifting of power in a relationship as events unfold or the way that your actions and discoveries slowly fill in a timeline that measures events in minutes but also telescopes outwards to capture years and centuries. This thing is a wonder, a narrative inversion of the tech tree from Civ, almost, in which rather than unlock new abilities you steadily recontextualise your own knowledge. 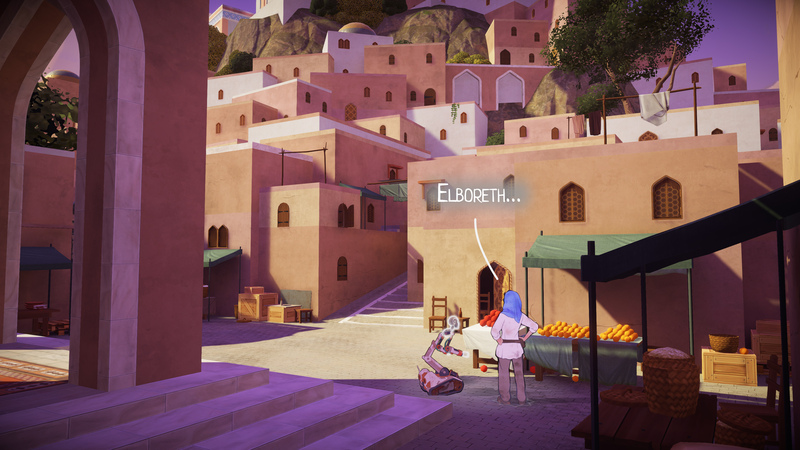 Heaven's Vault does a beautiful job of letting you unlock a language, and thus a dialogue of sorts, with the past, via a wonderfully engaging protagonist. ...Heaven's Vault communicates the beauty of assigning meaning to symbols, and thus the people who wrote them. While I may have hated sailing, there’s so much more to Heaven’s Vault than that. This is an absolutely beautiful game that manages to succeed at something genuinely unique and interesting. It also does something many of the best adventure games do. It makes me want to spend more time in its world, as Heaven’s Vault is well worth my time. These are characters I want to talk to, Ancient is a language I want to learn, and Heaven’s Vault is a game I want to replay. Maybe next time I’ll actually figure out how to write the whole review in Ancient. Minor issues aside, the gameplay is just sublime. I never would have thought that I’d enjoy an archeological/language adventure game so much. Heaven’s Vault is a stunning achievement in interactive narratives and is an absolute must play. 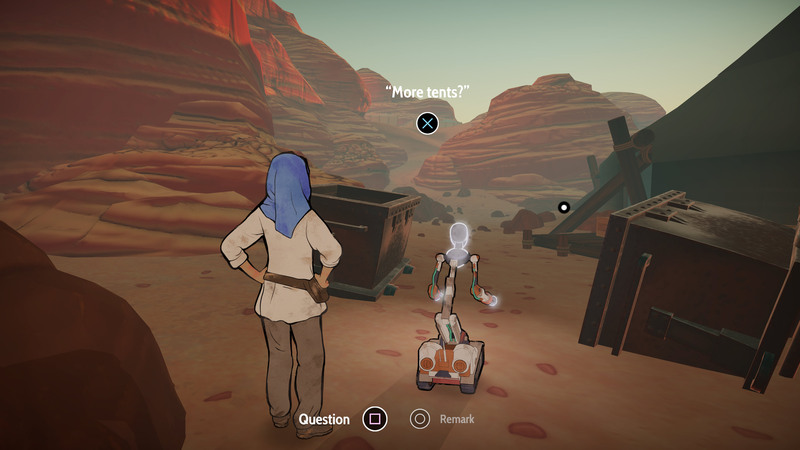 Heaven’s Vault does hold great potential; Inkle’s commitment to delivering an alternative (and more realistic) take on video game archaeology, and to encouraging players to decipher and learn a language, is inventive and mentally stimulating. But holistically, the experience is humdrum; there’s little incentive to keep on unpacking its world if I don’t buy into its fiction. And sadly, I do not. 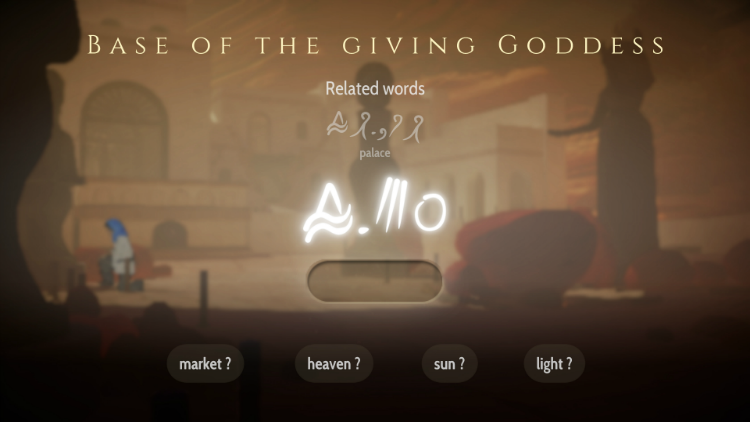 For a game that revolves around the beauty of languages, it’s a disappointment that Heaven’s Vault can’t find the right words to express itself. Can't wait to check some reviews, though might not even bother and just do a blind purchase. Does anyone know the Steam pricing yet? I need to buy this when it goes up. Missed the chance to call the OT "Basically Tomb Raider"
I'm interested, although there are several promising adventure games all coming out at once this month. Whispers of a Machine (from the Kathy Rain dev) is the big one, but there's a promising-looking game called Minotaur coming into early access, and Lorelei (third in the Cat Lady trilogy) also comes out sometime this month. Have just enough in my Steam Wallet for it, perfect! Cheers, all look very interesting. Whispers of a Machine definitely has my attention. I love games that just come out of nowhere for you, those are the best. I've been playing this for the past few hours or so since release. As an ancient historian/linguist, this is right up my street. If you're the kind of person who goes "a ha, that's the noun marker!" when you look at unfamiliar languages, and have any experience looking at material culture as evidence for the way people lived/thought, you'll definitely enjoy this; even if not, it's a highly enjoyable adventure game thus far. - the language solving; it's not particularly hard, but it's very satisfying to piece things together. - the overall look of the game. The environments are beautifully rendered (very The Witness-esque in style, I think). While the 2D slidey portraits may not be to everyone's taste, they are attractive enough. - the density of the narrative. Unsurprisingly given that it's from Inkle it's well written; there's all sorts of different threads I could be following right now and they're all equally interesting. - the sailing, although the universe is lovely to look at, is a bit boring. With this and Whispers of a Machine this week (that release date snuck up on me - but as a huge fan of both Kathy Rain and The Samaritan Paradox (seriously, if you've not played the latter DO SO) I am very excited) it's a good week for me! So excited to play this tonight. I'm in love with the concept. What were they thinking with this sailing minigame? It is incredibly janky, it takes forever, and it is not fun in the least. Am I going to have to do this every time I go to a new place? It's so bad that I don't think I can deal with wasting my time with it if it is going to force me to do it every time. Wow, what a way to absolutely ruin an otherwise incredibly compelling experience. It's....pretty prevalent, yeah. Sometimes you can jump in the hammock for a nap to have Six fast-travel you to a destination you've visited previously, but I'm not 100% sure what triggers that option (lack of dialogue it wants you to see while sailing, maybe?) and certainly does not appear all the time or even most of the time. Yeah I just had to do it for the fourth time and it is really bad. Putting this down, hopefully they'll patch in the ability to skip this part entirely in all circumstances. A bit more time put into it now. As with flyinj's comment above, the sailing really beings to grate as you play for an extended period of time. I haven't been able to skip it recently - even to get to main cities - because of Plot Reasons, and it's dead time too often. When you hit one of the rapids and go incredibly fast, it at least feels like you're making progress... until you look at the map and realise you still have a long, long way to go. A shame, because I'm still really enjoying the story; I'll certainly keep going, but I ended a play session yesterday because I couldn't face the looooong journey I had to make. - I didn't go to Renba's funeral because I was too wrapped up in exploring. I feel this was a bad idea, but... what's done is done. I am worried that I might have cut off a very interesting plotline about the Professor not being all she seems... but I've not been back to Iox in ages. - I didn't sell Six to get information on the Withering Palace. I seem to have been able to get this anyway; if I had done, I presume I wouldn't be in the situation I am in now, where Six has turned into something else - another interesting plotline. - although I had no compunction having my friend look at the Imperial Crown. Shame she couldn't find out anything particularly useful about it. The translating is actually quite "pointless" - it doesn't progress the game at all, really, and it doesn't massively further my understanding of the game's lore. It is, however, still enormous fun. I'm loving it so far - Aliya is becoming my favourite female protagonist since Jade in Beyond Good and Evil. By the way, everyone should play 80 Days, its a fantastic game as well. Played a few hours last night. Hate my dumb robot and hate sailing. Game is pretty janky too with lots of stutter in performance. The selling point of this game is the translating first and slowly and methodically working out the history. The performance on Pro is definitely a bit of a shame. Some pretty big stutters and framerate issues. But that aside I’m really loving the game as I hoped I would. I love the characters and I love the translating. I’m excited to get deeper into it. 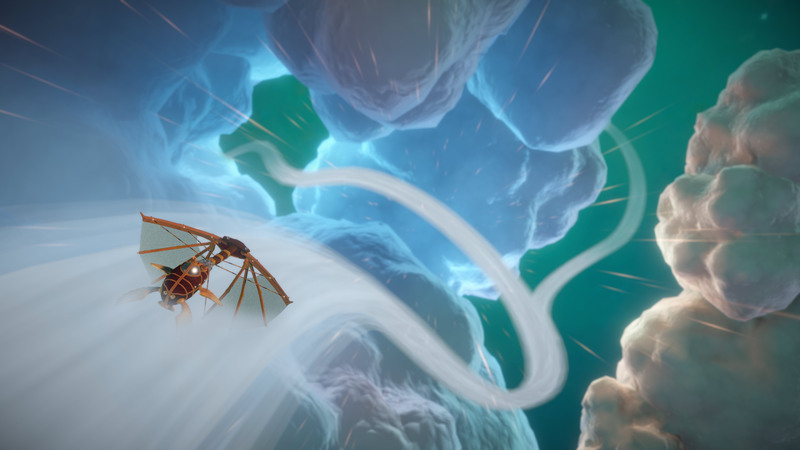 Although I can't fault the people at Inkle for tech support (they fixed my messed up save within about an hour! ), there's an annoying number of bugs in this. - the camera goes bonkers when talking to Huang on Iox; I once had a lovely close up view of nothing but his tunic. I guess it's trying to work in a very confined space but it doesn't really happen. - the game also occasionally hangs in conversations with him, or if you try and look at a ruin on the rivers when the game isn't expecting you to. Still enjoying myself, but I worry that each time the game seems to crash it's going to wipe out my progress - I won't be starting again! It’s definitely got it’s far share of technical... hiccups. I keep getting the thing where the closeup camera will freak out when in conversation. Or the person I’m talking to will disappear. I initially turned up the speed of the text/subtitles but had to reset it to default because it went so fast that it was unreadable. But I’m still finding myself obsessed with the game. I adore the language stuff and it’s so fascinating to decipher it all gradually as you explore the story. I’m so happy with the game.